The best way to rest, relax and rejuvenate after a hard day's work is to visit the bath. And in order for the rest to be complete, the room should be equipped with maximum comfort. Not the last role is assigned to the regiment, its location in the steam room, design features and manufacturing material. It is easy to build convenient shelves for a bath with your own hands, the main thing is to strictly follow certain rules. Shelves in the bath is a simple design consisting of the seat and backrest. The usual shelf in the bath is a simple design, which includes a support post and a seat. Two beams are needed for the construction of the support post. They are set across the width of the bench and connected by jumpers. The connection pitch is not less than 0.5 m. The seat should be made with a slight incline so as not to impede the flow of water. Between boards that will be stuffed on the frame, there must be a distance of 1.5-2 cm. Dimensions of seated and recumbent regiments. Many-tier shelves with steps are typical for saunas, where they take a steam bath while sitting. For the Russian bath is more suitable single-tier design, so that you can comfortably lie down, and nothing has hindered the bather. Depending on the growth of the bather, the height is also selected. During the procedure, he should not bend or hold his hands at an uncomfortable height. The most comfortable height is 70-80 cm. The distance from the shelf to the ceiling of the steam room should be at least 110 cm. This will allow you to enjoy your rest in the bath not only lying, but also sitting. The dimensions of the regiment are calculated depending on the area of ​​the room. 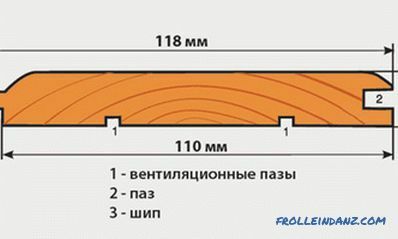 The most comfortable values ​​are a width of at least 90 cm and a length of 220 cm. 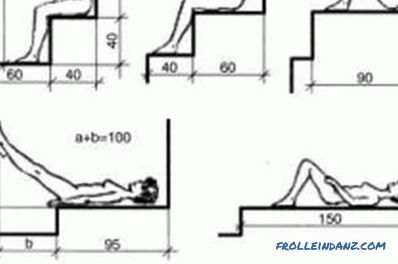 If the length is less, then to lie down, you have to bend your legs. Mounted shelves along the walls without windows. The number of tiers depends on the desire of the owner of the bath and the dimensions of the room. Most often, the shops in the steam rooms are set in steps so that lovers of “hot” procedures can rise higher and get maximum pleasure. A shelf installation option is not only steps, but also in the form of the letter “G” or “coupe”. In the first case, the upper and lower shelves are mounted along one wall, and the middle one is mounted on the next one. In the second method, 2 shelves are made and installed on one wall. Following the example of a train, the upper shelf can be raised and fixed in this position. This is ideal for a small steam room. Recently, such constructions of shops, which, if necessary, are easily disassembled and taken out for drying on the street, are becoming increasingly popular. In addition, the entire structure should be open at the bottom to ensure maximum ventilation and easy room cleaning. All parts must be carefully fitted to the design is not loose and does not creak. Surfaces should be made smooth and avoid sharp corners. In the construction of regiments for the bath with their own hands there is one difficulty - the fasteners of parts. Sizes of the corner many-tier shelf. There are several options for this. The best, but also the most time consuming - do without nails and screws to avoid burns from touching the hot metal. In this embodiment, wooden wedges are used, which should be driven into the holes prepared in advance. When using self-tapping screws or screws, their caps should be completely “recessed” in the wood or fixed on the inside of the structure. 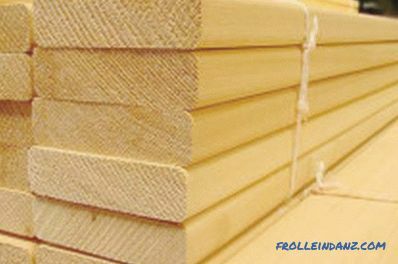 Timber from which it is planned to make shelves in the bath should meet certain needs: withstand high humidity and high temperature, be distinguished by high density, low thermal conductivity and low resin content. The best material for making shelves is linden. Its beneficial properties, gentle aroma and healing properties are known to many lovers of bath procedures. 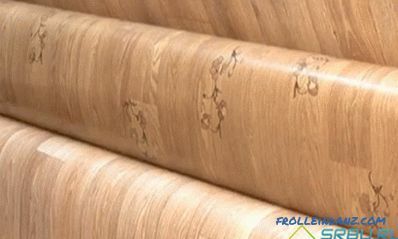 Wood is easy to process, can dry quickly, does not crack and slowly heats up. Linden has only one drawback - under the influence of high temperatures, it may darken over time. Wood for a shelf must withstand high temperature and humidity, linden, aspen or oak fit. 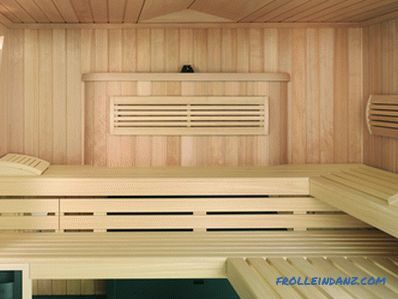 A good material to build a steam room in the sauna is aspen. It is believed that she takes on all the negative energy that has accumulated in a person. Aspen bath shelves can charge a person with a positive, give him a feeling of satisfaction and relief. The material has a low price, so builders often prefer it to him. However, all records for various useful characteristics and endurance beats the African Abashi tree. He is not afraid of even the highest temperature and humidity, it practically does not heat up and, therefore, will not burn a person. In the process of using the material does not lose its properties and retains its original appearance.The only drawback of this wood is its high cost, so not everyone decides to use it for building a bath. The framework for the regiment is constructed from several bars. Drill and drill bits in wood. Grinding machine or sandpaper of different grain. Bars for frame 50x70 mm. The construction of the regiment in the bath begins with the construction of the frame. First, you should prepare 10 bars, from which to collect 5 racks. To connect them, 2 segments of the same bar are used. For each rack bars are attached with 2 screws. The flooring will be made of boards. For the upper shelf, 7 boards will be needed, the lower one is made of 3. Their length should be such that there is a gap between the benches and the walls for the subsequent covering of the walls. To fix the boards to the frame must be at a distance of 20 mm from each other. In order to properly make the shelves, all parts of the frame must be fastened with wooden wedges, which are hammered into the prepared holes. However, many in the construction of the bath prefer the usual fasteners. The caps of the screws are completely sunk into the wood. Flooring is done from 5-7 boards. When building a bath, the lower shelf in the steam room is made mobile. Most often it is a triangle. In the role of its sides are adjacent walls. This design contributes to a more compact arrangement, leaving a little free space in the room. The space between the benches should remain open. If you want, you can build backs. For this, the gap between the steps is covered with boards. For ventilation, gaps must be left above and below. If to use boards from coniferous breeds of a tree, then the unique atmosphere possessing medicinal properties will be established in a bath. For a bath with a small steam bath, the option with a retractable bed is ideal. 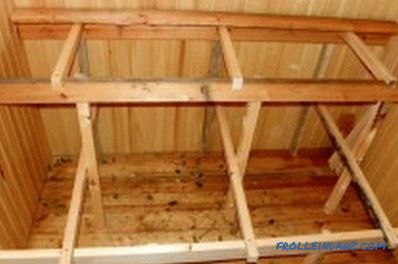 To make a folding shelf, it is necessary to attach bars to the end walls of the steam room. Then fasten the axles: one end to the bar on the wall, and the other to the end of the plank bed from the inside. 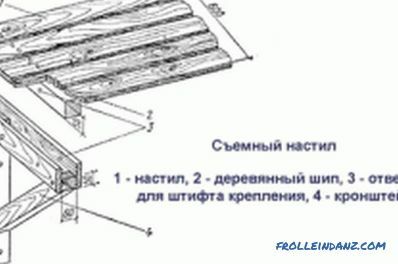 On the axle, you need to put on wooden strips that serve as levers. 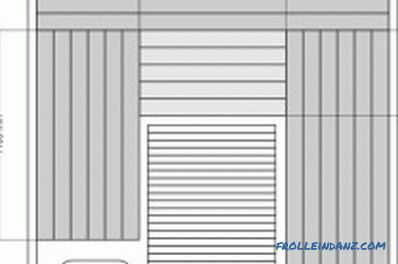 For the mechanism to work without obstacles, it is necessary to cut corners on the upper parts of the slats. 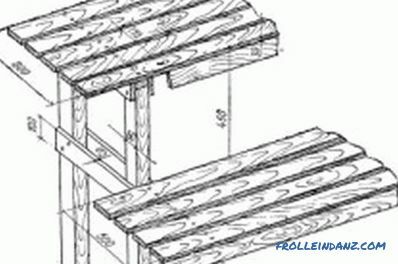 Scheme of a removable shelf. Bars, which are mounted on the wall, must be of the same thickness as the end parts of the bench. For a more dense "sitting" strips on the axis and their movement without backlash, you must install wooden washers. This mechanism on the basis of its action resembles the work of a retractable sofa. 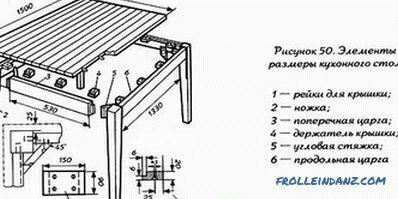 Thanks to this mechanism, the bed is extended to the required distance. He leans on the legs. Before you start using the steam room, you need to process the wood. This will provide an opportunity to extend the life of the material, prevent its damage. Chemicals for these purposes use is strictly prohibited. High temperatures trigger the release of harmful substances, which can cause poisoning or an allergic reaction. It is necessary to use compositions that are designed directly for the bath. For their manufacture using natural oils. 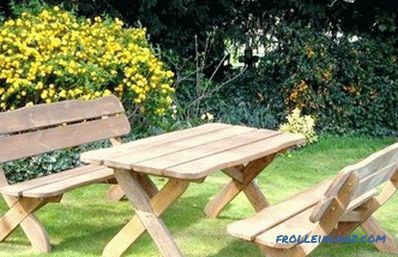 The composition covers the wood with a protective film, protecting it from damage, and at the same time does not spoil the natural characteristics of the material. You can also use edible linseed oil. 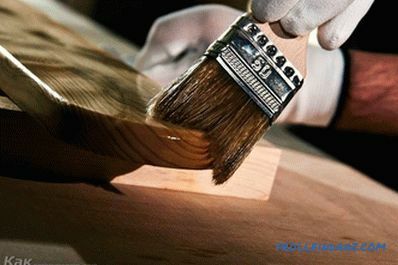 It should be heated, and then applied with a brush on wooden parts, carefully rubbing. You can also use cold oil. Only after that the surface is thoroughly heated with the help of a building dryer.